If you haven’t noticed, the Exalted hack has gotten much longer and more complete now. Not all the way done yet, but we playtested it last night and now I have some new ideas for finishing it up. (At least until we play it a lot more, which will inevitably lead to more tweaks). I’m gonna keep editing and expanding the original thread, but I’ll also post new messages occasionally to let people know what’s going on. There’s a massive thread on RPGnet about the hack (which I didn’t start, since I never really go there). I’ve posted some new ideas and updates there, including the playtest scene we ran last night. It’s pretty crazy how positive the response has been so far, considering how out-there some of this design stuff is. Last Updated Sept 17 2006. The purpose of this project is to make use of the rich varieties of information in the Exalted core rulebook, to play by a completely different set of rules. These rules will largely be based on a “structured freeform” design aesthetic. This is a work in progress and comments and suggestions are welcome. Thanks to Shreyas Sampat, Thomas Robertson, Selene Tan, Daniel Solis, Tobias Bindslet, Dev Purkayastha, Neel Krishnaswami, “Matt,” and Lauren Deans for help so far. And probably some other people too. Brand Robins really wanted to help but couldn’t. I’m gonna walk through character traits to explain how to create a character and how to use your character in play. Shreyas and Neel have both created sample characters, with some dubious correlation to the actual rules listed here. Aside from being what people call you, your Name also indicates the general power level of your character (what is normally called your capital-E Essence). It demonstrates this by the number of capitalized words in your Name. Mortal have 1 (Aeryn, Lukka), mortal heroes have 2 (Aeryn of Taelsin, Lord Lukka), and the Exalted have 3 and up (Aeryn the Blade of Forever, Lukka Mask-of-Seven-Winters). When you create a character, it’s important to record their previous names too, since they have not always been the August Lady Vespertine, especially to those who know them personally. People can have many names, so the being who calls herself Deadly Arc of Ten-Thousand Angry Shadows may be a charlatan without an ounce of power to her name. But she might not be. You need not determine your Name at the start of character creation. In fact, it may be easier to decide this last or at least tweak your final choice once you have a better sense of who your character is. Character creation can often be an exploratory process, so do what works best for you. This is who your character is and who the world knows them to be. A good plan is to write down a basic Concept before beginning character creation and then, once you’ve finished, change your Concept to reflect who the character actually ended up becoming. For example, you might start out with something like Spoiled Princess of a Formerly Illustrious House. But during the process of creating her, you might take a bunch of abilities related to sailing and fighting, which doesn’t quite fit your original Concept. So in the end, you might choose to shift your Concept to Blacksheep Princess Slumming as a Privateer. Your Concept also must change each time you gain a level of Name (Essence, in the original rules). This reflects that you are no longer the person that you once were and that the world has made note of this. This version of the rules only includes guidelines for playing members of the five Castes of Solar Exalted: Dawn, Zenith, Twilight, Night, and Eclipse. Your Caste is notable for helping define your original array of traits. It also determines the initial stylings of your Anima banner, as usual. These are exactly as normally described, the main purposes that drive your characer. Unlike the advice given in the core rulebook, Motivations don’t have to be especially mythic. They also include what, in other games, might be called ‘relationship traits’: you love someone, you hate someone, or you’re in a hierarchical relationship with them of some variety. In any case, Motivations are what gets you out of bed in the morning, whether it’s Killing the Elemental Dragons, Obeying My Mother, or Seducing Prince Hakka. You should start with at least one Motivation but no more than two. Starting Motivations should place your character directly and unavoidably in the path of one or more of the other characters, for good or ill. Other Motivations can be spontaneously created during play. In general, Motivations serve to frame the overall campaign (long-term Motivations) as well as particular sessions (short-term Motivations). Motivations develop over the course of play, either single sessions, multiple sessions, or the entire campaign. They inevitably transform into new Motivations, but at different rates based on whether characters are able to make real progress on them or not. At the end of a scene in which a character has attempted to address one of their Motivations, their player should record a summery of what they were able to accomplish. If they were completely frustrated in their attempt, that’s important too and deserves to be written down. These are called Accomplishments. It is obviously easier to work on Obeying Mom than Killing the Elemental Dragons. However, depending on the circumstances, the former might end up causing more pain and anguish (and, ultimately, growth) than the later. This game does not pass judgement on your Motivations. However, it does recommend that you try to maintain a variety of Motivations, from daily responsibilities to impossible moon dreams. This fits better with the rules and may even, we dare to suggest, lead to a more complex and fascinating character. But it may not. If a character ever completes, abandons, or wants to alter their Motivation, another Motivation needs to be created to replace the previous one. This need not happen immediately, since it might take a few scenes for the character to figure out what to do next. Once a Motivation has been replaced, its associated Accomplishments are converted into Experience — 1 XP for each. Note that this XP is not gained until the Motivation has been replaced, even if it has been completed or is no longer valid. Each character interprets the four core Virtues (Compassion, Conviction, Temperence, and Valor; but not Deference) in an individual way. This demonstrates their morals and general personality. For example, Compassion might be interpreted as Never Abandon Those in Need or as Treat My Enemies With Honor. Virtues serve to frame individual scenes. 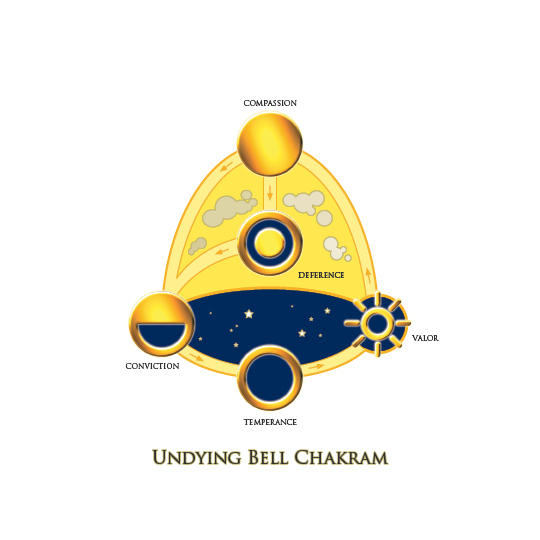 Each space on your character’s Undying Bell Chakram is connected to a specific Caste (and their related Excellencies) and their chief Virtue. A piece representing your character is placed on your Caste’s space when play begins. You frame scenes around either (1) the Virtue you are currently on or (2) a Virtue that you are moving to. Acting on your current Virtue allows you to stay on that space. Acting on the next Virtue (following the arrows) moves you to it. Going against one of your Virtues gains you a point of Limit, but it also enables you to move backwards around the Chakram, from sunset to sunrise. Going against your Flawed Virtue gains you 3 points of Limit. Every Solar — except Eclipses — gains a point of Limit from demonstrating Deference, which is unnatural for Solars. When you hit 10 Limit, you experience Limit Break, a crisis of Virtue, and descend into the darkness of your Flaw. o focus on each time. In a scene in which the GM is not directly addressing one of your Virtues or Motivations, see if you can address it anyway, making the scene multifaceted and more interesting, but not hogging the spotlight at another character’s expense. This earns you experience, gets your character closer to their goals, and is also considered BEING A GOOD PLAYER. Sing, muse, of the rage of Achilles. You can pick a Flaw from the book if you like, but ignore the mechanics and keep mainly the descriptive concept. Or make one up. As usual, it’s tied to a particular Virtue (usually not the Virtue held sacred by your Caste, but it could be). Solars cannot have their Flaw be tied to Deference, which isn’t a proper Virtue, just something they’re all bad at. Eclipses are merely slightly less bad. When you reach Limit Break, your Flaw takes over for at least the remainder of the current scene. You cannot continue around the Undying Bell Chakram to a new Virtue or demonstrate your current Virtue until you demonstrate your Flaw to the satisfaction of the other players (including the GM). Treat every new scene as a scene in which your Flaw (instead of a Virtue) dominates until this is resolved. In order to crawl your way out of your Flaw-induced binge of sin, you must reinterpret one of your Virtues in a radically different way in order to restructure your values and carry on. Once you have satisfactorily demonstrated your Flaw, pick one of the Virtues that has been causing you to gain the Limit (by breaking it) and reinterpret it. For example, your Compassion might change from Never Abandon Those In Need might become Sometimes People Really Want to Be Left Alone. These take the place of Charms, basically describing the cool things you can do. Some of them are bound to be combat-related, but none specifically have to be. In this version of the game, you can fight swords with rhetoric or dancing pretty easily. Excellencies start out with a rating that can increase over time as you develop your abilities. Like your Name, this rating is measured by the number of capitalized words in the title. For example, you might start off with (1) Sail, which later develops into (2) Unerring Navigation, (3) Expediant Migratory Pattern, (4) Sky-Spanning Solar Harness, and (5) How Perfect the Celestial Chart Memory. You might notice that, as they develop, they also become more specific and imbued with a unique type of color, as you develop your own style and way of handling things. They also do not develop linearly, like (1) Melee, (2) Stabbing Things, (3) Stabbing Things Better, (4) Stabbing Things More Better, etc. Each new level centers on a different aspect of the level before it, becoming more powerful but also shifting focus. This serves to broaden the overall range of your abilities while narrowing specific instances of them, if that makes any sense. When creating a character, you start with your five Caste Abilities and Favored Abilities (Solars get 5) as level one Excellencies. If you are starting play as a mortal hero and going to run the Exaltation, you get 3 points to spend on developing your starting Excellences, though none can be above level 2. 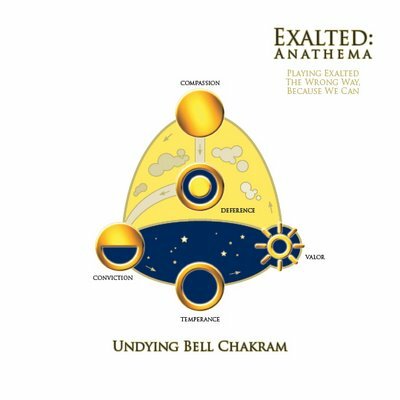 If you are starting as a Solar Exalt, you get 8 points (3 + 5 more) and none can be above level 3. Feel free to draw inspiration from the Charms listed in the main rulebook (you may have to shorten or lengthen their names), but you can easily make up your own. Excellences can be used during any scene, but they are most often invoked in conflicts, a special type of scene. 1. Call somebody out and have your challenge accepted. 3. Roll dice (d10s, of course) equal to Name (Essence) + Total levels of Excellencies being used. Count 7+’s as Impact (not Successes), but DON’T TOUCH YOUR DICE AFTER THE ROLL. Note that Impact does not indicate degree of Success or Failure, but rather the degree to which your actions make a difference to others and the world. The failure of some people can matter more than a great victory by others. A. If you are rolling dice of two different colors (which makes this easier), put your dice in order, starting with the person who rolled the LEAST Successes. So that player would place all their 1’s in a line, followed by the 1’s of opposing player, then the 2’s and so on. This line represents the “shots” (think movies) that make up the conflict. Each player narrates for their dice. B. You can achieve the same thing taking turns narrating. Each player just seperates their own dice into 1’s, 2’s…. 10’s. And then you narrate ‘tennis’ or ‘pin-pong’ style, starting with the player with the LEAST successes. They narrate their 1’s and then the other player narrates theirs, etc. 5. After the narration is over, you determine the overall consequences using the Impact rolled by each player and the character’s Anima levels, described below. The rest of these are story- or character-sized pacing/structuring mechanics. Anima structures individual conflicts. Players define a range of Anima effects for their character (originally based on their Caste, but these can change over time). When a character uses Excellencies above level one, their Anima advances a level. Once the character reaches their last Anima level, they have exhausted themselves (run out of Essence, in the original rules) and cannot invoke more. Characters gain new Anima levels (and the effects that go with them) as they grow in power, which is a new thing. This means more powerful characters can use a lot more Excellencies before feeling the burn. After a conflict, the Anima levels of the participants also determine the scope of the consequences. No Anima indicates a minor consequence, while Anima 5 means the situation of the entire region was likely changed as a result. These are your recollections of your past lives. They start out cloudy and become much more focused and specific as play develops. So a mysterious guilt from past disobediance might turn into a complex story of betrayal involving specific historical people. Memories develop as players pursue them. Memories are important for understanding and learning how to use Wonders, the lost relics of the First Age. Wonders only allow their secrets to be unlocked by those that understand their history or who were inimately connected to them in a past life. I promise I’ll get this one into a playable form. Soon. So Push 1 is out. The rumblings about Push 2 and Four Nations have started. Which leaves me with the Vesperteen, my pseudo-sequel to Jason Blair’s childhood horror game, Little Fears. Shreyas decided that he’s going to make two new, different games, neither of which are probably going to be called “Torchbearer,” to plug the font in his psyche that Torchbearer was supposed to cap. I wish him the best in that, but I’d really like to finish a game about the core concept of Vesperteen, which was that power and social standing among teenagers is derived from sinful deeds and that the exchange of sin for power is a dangerous, addictive one that can turn kids into monsters. It’s about the fear of growing up to become an adult that you don’t actually like or respect. Interestingly, the current not-so-good prep school witch movie, The Covenant, is about this same theme. It’s possible that seeing it awakened my desire to do this right. But it’s clear that Vesperteen is going to have to bend to reflect design skills and interests that have grown and changed since I last worked on the project, especially my recent revelations about creating game content that evolves and develops as you play with it. It’ll also probably need a new name, eventually. Because renaming a thing has the potential to reenergize a project. It’s not something old, but something new and exciting. Right now, Young Monsters or When We Were Monsters are winning. – Can the Squick Chart evolve over time, as the players get more comfortable exploring sensitive issues with each other? Maybe the initial Squick Chart is created by the initial Truth or Dare stage that performs the bulk of character creation, based on what characters will do or admit to having done. – Perhaps you only define as many Squick levels as characters have actually performed in play. This makes the exploratory nature of discovering sin much more obvious, since you wouldn’t really know what you were getting into before you encountered it. However, I would worry about the potential for such play to be dangerous, since that’s what having a fully defined Squick Chart was originally supposed to mitigate. – I think the GM is going to be responsible for playing two characters: the town (all the adults) and the school (all the other kids). Just like PCs, these two entities have past sins that they have performed, the exploration and uncovering of which may make up a significant portion of play. Maybe you want to figure out why weird stuff happens around the site of some mysterious accident. Dealing with the sins of your fathers (and mothers and peers) and all that jazz. And just like PCs, entities that are part of the town and school always stand the risk of turning into monsters (one of the benefits of treating them like PCs). – I’d like the details of NPCs lives and past monstrous deeds to be emergant in play, becoming more complex and interesting as players choose to explore them. And I’d like this to be supported mechanically. But I’d also like to keep the paperwork to a minimum, having learned from games like Continuum (which is awesome, but requires too much record keeping). I’m still pondering how to do this. Terra Nova is Da Blog! Sorry for the title. I was watching Busta Rhymes videos this morning (“Flipmode is Da Squad!”). Terra Nova is a terrific blog about MMORGs. I read it all the time and you probably should to. This week, aside from posting about the World of Warcraft themed Coke ad campaign that features Chinese girl band S.H.E. and European futbol star Ronaldo (which has to be seen to be believed), Terra Nova summerizes a discussion by Blizzard and Bioware employees about why certain MMORGs have been more successful (both commercially and in generating lots of fun play). All of these also apply to roleplaying. Personally, I’m hoping we find more options besides combat soon (we already have pretty sophisiticated ways of handling non-violent conflict), but there’s a lot to be learned here. StoryGames Boston is coming to Pandemonium! Every Wednesday evening, come to Pandemonium Books and meet others interested in roleplaying games and storygames. Find new gamers, talk about the hobby, and then join us for a pickup game – or bring your own. And if you’re new to “storygames”, then we’ll gladly show you what its all about. Story, people, dice and the comfiest couches ever. What else do you need? * Baron von Munchausen: Portray an adventurous noble, telling fantastical (but entirely true!) tall tales in the style of “Baron Munchausen”. * Agon: Odysseus. Atalanta. Perseus. You are Greek heroes of legend hoping to best each other with feats of cunning and might, winning great glory for your name. But your dark fate waits just around the corner. What songs will they sing of you? * Once Upon a Time: The popular story-telling card game about fairy tales. Use your cards to tell your own story, and be the first one to play their Happy Ever After card! * InSpectres: Things go bump in the night. It’s a good thing the InSpectres are in town! Play out the trials and tribulations of your local franchise of supernatural exterminators. * 1001 Nights: A game of enticing stories. The Sultan’s courtiers are held captive in his court. Only through the stories they share can they find freedom and achieve what they want. In the storytellers’ own terms, the requirements of the performance are summed up… mouth, hand, body, step, spirit (kou shou shen bu shen). There is a limited range of movement called ‘half open door’ (xiao kai men) that characterizes the acting style of Yangzhou storytelling. This is not only in contrast to the practice of Suzhou storytelling (Suzhou pinghua) — ‘wide open door’ (da kai men) allowing larger gustures and moving around on the stage, away from the table — but also to some other narrative traditions where acting is further restricted to small finger movements. The other so-called props are items of everyday usage: handkerchief, fan, and teacup. The storyteller, just like the audience, will drink tea, fan himself on hot days, and wipe his face with his handkerchief. The handkerchief and fan are, however, used every now and then in a secondary function, namely to represent various objects of the story. The folded fan is used to symbolize weapons such as a knife, a sword, a gun, etc, or other untensils such as a whip, a paste-roller, chopsticks, etc., while the unfolded fan may symbolize a wall or screen. The handkerchief may represent a letter, an official document, a book, a tray, etc. …Just as the storyteller himself impersonates many different characters during a performance, he also uses these two props to symbolize many different things, but only seldom to represent what they are — the fan as a fan. The plot development is seen as a series of ‘crises’ (guanzi) or points of suspense. The storyteller must handle the sequence of ‘crises’ in such a way that the audience is kept in a fluctuating mood of suspense and relaxation. At times the story flows in a slow and relaxed moon of so called ‘cold crises’ (leng guanzi), then suddenly moves swiftly into a ‘story of crises’ (guanzi shu) or ‘hot story’ (re shu). While some storytellers strive to tell continuously in the ‘hot’ mood, others prefer a balance between hot and cold. A second way of creating suspense is to give some hints at an early stage of what is going to happen later, called ‘airing the crisis’ (liang guanzi) or ‘giving a clue’ (angen). …there is often a crisis that is not brought to a solution, called to ‘bargain the crisis’ (mai guanzi). The ‘bargaining’ is intended to bring the listeners back the following day to hear the outcome. …they distinguish different kinds of ‘talking’ (bai). Every tale is a combination of dialogue, called ‘public talking’ (guanbai), and non-dialogue, i.e. all other forms of narration, called ‘private talking’ (sibai). The latter category includes narration of events, descriptions of persons and scenery, storyteller’s comments, and — perhaps somewhat astonishingly — inner monologues of the characters in the tale. …generally storytelling was divided into four schools (si jia): ‘stories of love and marvel’ (yinzi’er), ‘stories of crime and adventure’ (shuo gong’an & shuo tieqi’er), ‘stories from the Buddhist classics’ (shuo jing), and ‘stories from history’ (jiang shishu). Among the northern storytelling styles, Tianjing storytelling (tianjin pingshu) is performed in a lively milieu in teahouses and storytellers’ houses in the centre of town. A most interesting characteristic is the spontaneous dialogue between the performer and his audience that takes place, not only during breaks, but also during the storytelling proper. During the last half century, since the birth of modern China, the creation of new works of quyi [narrative arts], including storytelling — as a political weapon — was given official attention and government support. Quyi, reflecting movements and campaigns all through the 1950s-1980s, such as the Anti-Japanese War and the reconstruction of the country, are sometimes individually authored (and may be performed by the author). Sometimes such works are recreations of popular modern stories, known throughout the country [probably thanks to revolutionary opera or other media]. This type of ‘new storytelling works’ (xin shu) are mostly short, not longer than a single session of storytelling [compared to the traditional 40-day serials], and often even shorter, so that several different performances are stringed together to make up an afternoon’s entertainment. I’m only a third of the way through this book, but already I feel that this tradition is a rich, deep well that younger storytelling traditions (such as roleplaying) might easily drink from. Lots of good stuff here.